The dai pai dong is a street-food stall found in Hong Kong, most popular in the post-war period. Characterised by its flexibility, dai pai dong pitched on the kerbside all over the city, comprised of an assemblage of things — stools, folding tables, buckets of washing up, bamboo poles, fabric awnings and various pieces of cooking equipment. In the chaotic years after the Second World War, dai pai dong were a lifeline for the working-class, as an opportunity to make a living and as a cheap way to eat familiar foods when living space was scarce. As Hong Kong’s economy grew with the success of its light industry in the 1950s and 60s, the 70s brought a widespread “modernizing” of the city, dramatically changing the urban landscape, and dai pai dong within it. This paper traces the dai pai dong throughout this period, exploring the various typologies of dai pai dong, how and why they inhabit these spaces, and how it has influenced, or been co-opted for, a specifically Hongkongese identity. Using components of the dai pai dong assemblage — the stool, the table, the roof and the walls — this research aims to de-construct the dai pai dong in four different contexts — the body, the street, the public housing estate and the indoor cooked-food centre. Vivien Chan is a design historian based in the UK. 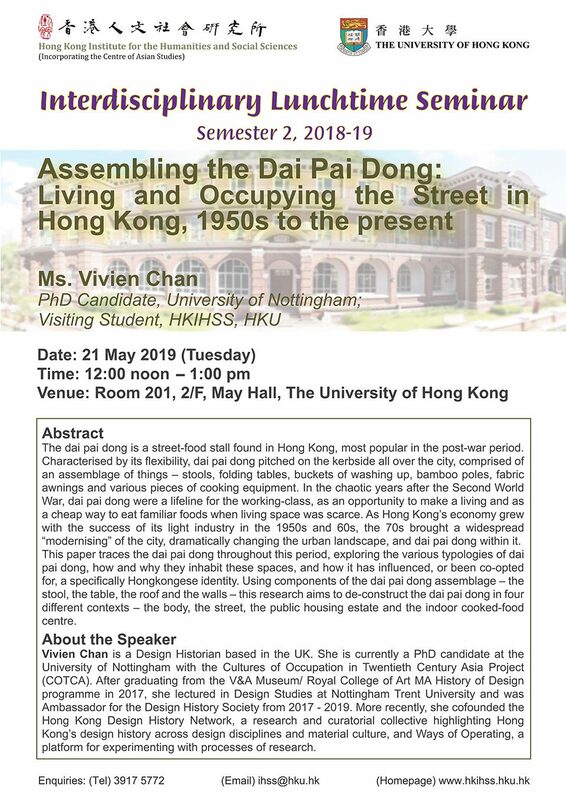 She is currently a PhD candidate at the University of Nottingham with the Cultures of Occupation in Twentieth Century Asia Project (COTCA). After graduating from the V&A Museum/ Royal College of Art MA History of Design programme in 2017, she lectured in Design Studies at Nottingham Trent University and was Ambassador for the Design History Society from 2017 – 2019. More recently, she cofounded the Hong Kong Design History Network, a research and curatorial collective highlighting Hong Kong’s design history across design disciplines and material culture, and Ways of Operating, a platform for experimenting with processes of research.